We haven't talked much about our GEARMASTERS line here on the blog yet. I think it's time to fix that because GEARMASTERS is a crucial part of this company! In fact, GEARMASTERS is the foundation of how TheFireStore came to be and how we got our foot in the Fire Industry to begin with! It began when our CEO, Jim Witmer and his brother, Greg (former restaurant equipment salesmen) attended their first firefighters trade show. At this show they got the idea for turnout gear storage rack systems using the restaurant racking they'd been selling and working with all this time. 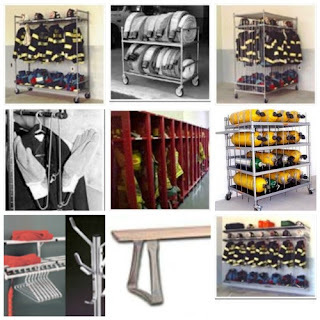 They went to the drawing board and began designing their own turnout gear storage racks for firehouses. Jim was able to use his own knowledge of being in the firefighting service to design and sell exactly what he felt was needed to make these things a success! It didn't stop there with just the basic Econo-Storage Racks, though. 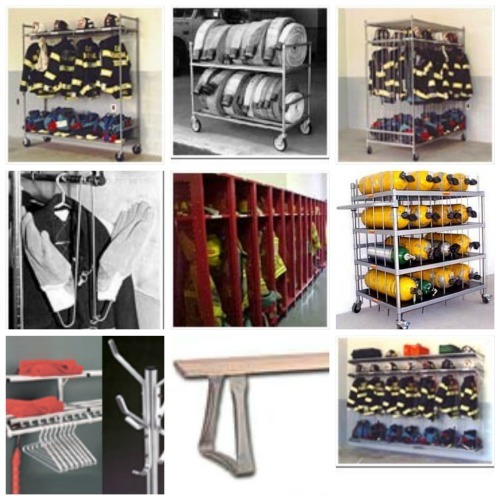 They went on to create and design and add to their line the Air-Dry Coat hanger and Glove hanger, special Command-Wall racks, lockers, benches, and more! GEARMASTERS will always be a special part of the history of TheFireStore! Since it is indeed the foundation where it all began, making TheFireStore what it is today.